Simple telemedicine software to boost practice efficiency and patient satisfaction. Chiron Health and CareCloud are entirely cloud-based services. No software to download and every user is always on the latest version. Automated eligibility checks with the most advanced telemedicine insurance rules database. Smart software that learns more with every check. Boost practice efficiency and patient satisfaction by seamlessly integrating video visits into existing practice workflows. Request a demo to activate video visits in CareCloud today! 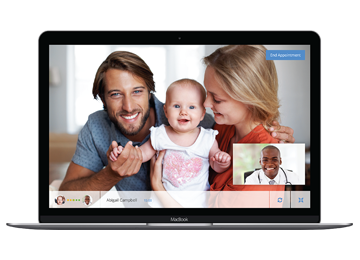 All of your in-office appointments are scheduled using CareCloud’s medical scheduling software – now video visits are scheduled there too. Simply schedule a ‘Chiron Telemedicine’ appointment using CareCloud’s medical practice management software, and it will sync automatically with Chiron Health. No duplicate work is ever required. It’s true, reimbursement for telemedicine remains challenging. That’s why Chiron Health handles the eligibility verification work for you. With the CareCloud integration, your practice will have access to the Chiron Rules Engine®, an industry-first telemedicine insurance rules database. We check the eligibility of every patient to ensure you’ll be reimbursed. Chiron Health video visit appointments are secure, HD video, and HIPAA-compliant. All documentation is completed in your current EHR, which means no new clinical systems to learn. With the Chiron Reimbursement Guarantee®, we guarantee full reimbursement from private payers for video visits (usually at the 99213 – 99214 level), or we’ll reimburse the claim ourselves.